Left your hometown? This could just be the next project for you. If you’ve spent considerable time living in another country or think you could help people who are planning to move to your home country, this could just be the business opportunity you’ve been waiting for. The opportunity in question is backed by the success of one man, named Stephen Palmer, who moved from Ireland to Australia in 2013 and now makes a full-time living by giving online advice to those who are about to, or have done, the same. Don’t judge me on my maths (or my ability to skim through Wikipedia) but there are around 7.4 billion people on the planet. Around 4.5 million of those are Irish, or roughly just 0.06% of the population. 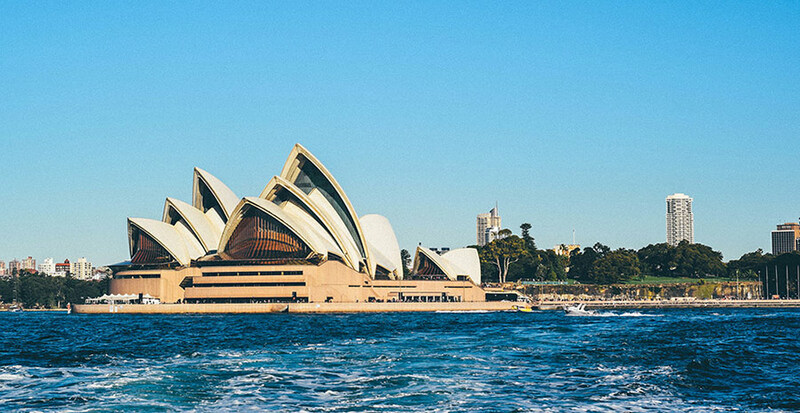 Only half a percent of Irish people are estimated to visit Australia each year – that’s around 22,000 of them – yet that’s exactly the audience Stephen is able to make a full-time living helping, with his website Irish Around Oz. The site, created in 2013, provides information for Irish people going to work in or visit Australia. Although the audience-focus is so narrow, the blog is doing incredible well. Over $10,000 per month well. This niche-focused site has attracted more than 4 million visitors in the last three years, and it’s growing. Stephen originally set-up Irish Around Oz as a part-time interest and was able to grow his income to around $2,500 per month. On the back of his initial success, and realising that there was a lot of potential to make more money with his target audience, he started working on the website full-time. Stephen notes this was the point that the website really started to grow and his income figures certainly back that up. Now averaging $7-$10,000/m, going full-time was certainly the right decision. When people look to start online ventures, one of the first things they often consider is whether there is actually a market there. Many people would have been sceptical about entering this niche due to the very low potential audience numbers. However Stephen’s success is testament that you don’t need to reach millions of people to make a living online. You just need to reach the right people. It was when I published 50 things you need to know before moving to Australia (now 60 things) that I knew I had found a massive gap in the market and Irish Around Oz was formed! With Irish Around Oz, Stephen has created a very real solution to genuine problems. 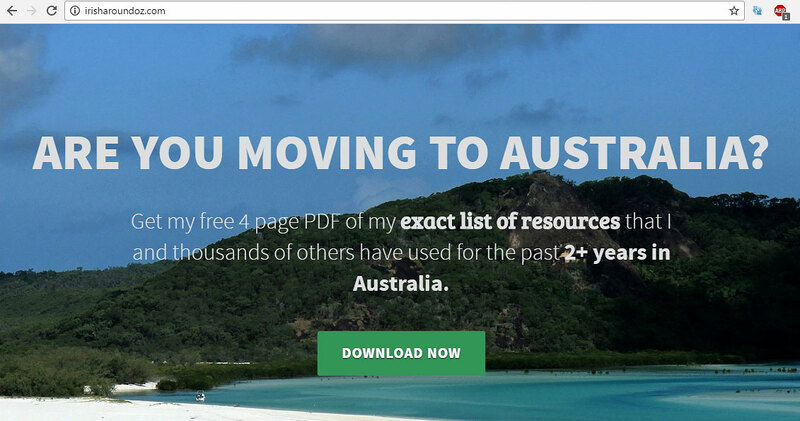 He’s worked hard to create the ultimate online resource for Irish people travelling to Australia. While the focus of the site is narrow, the site does aim to become a one-stop resource for his target audience. If you’re an Irish man or woman looking to emigrate, you’re going to devour the content on his website. That explains the incredibly low 3% bounce-rate he’s experiencing. Once Stephen saw the success of his site, he wanted to make sure that he was the go-to resource for his target audience. In order to do so, he created a number of Facebook Groups for his fellow countrymen to get advice on emigrating. With further groups in the pipeline for places like Adelaide and Darwin, this strategy – which we’ve never seen before – is clearly working. As mentioned, the focus here is hyper-local and as such, you aren’t going to break record numbers when it comes to traffic. If we look at SimilarWeb’s report on the site, Irish Around Oz is averaging around 30,000 visitors per month. The traffic-spike in July can likely be explained by this time of year being a summer holiday in the UK, and therefore more Irish families are more likely to be visiting Australia and looking for information online before they go. To generate such impressive revenue numbers with the traffic landing on his site, Stephen primarily uses a mix of affiliate links for products and services he recommends. The most prominent affiliate links that Stephen promotes are those to do with transferring money from Ireland to Australia. 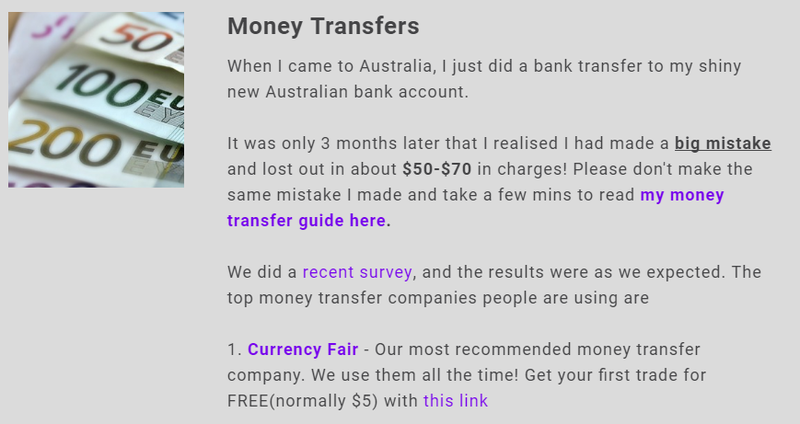 As he says about his own experience, he lost $50-70 in charges the first time he sent money down under, so wanted to make sure others didn’t make the same mistake. This is a really smart affiliate angle because people are going to have to transfer money at some point, they aren’t getting charged anything extra for using Stephen’s links, and are actually benefiting from his personal experience. Here’s a look at how those links are featured on his resources page. In total his resources page alone features 21 affiliate links, eight of which point to sites for transferring money from Ireland to Australia. There is nothing wrong with this of course, especially as he clearly states there are affiliate links on the page, but it goes to show how valuable they can be in a niche like this. Though we try to do an independent analysis of each site, it’s always great to hear from the actual owners to get their insights. Stephen was willing to answer a few key questions that we had about his journey. What’s your work schedule like? How much time do you spend on the site each day? This has varies so much over the past few years. After I quit my job I went travelling around the world with my girlfriend and my typical work day went down considerably. The good thing is a lot of the income is passive so I still earn money if I work or not. Id’ have to say anywhere from zero to 8+ hours if I have something I am working on. How long did it take from starting the site to making enough money to live off? Which sources of revenue are greatest for you. Is it the affiliate links or sponsorships (or other)? For me the key has been multiple sources of revenue. But right now the split is about 60% affiliates, 30% sponsorships, and 10% display networks. Thank you so much for your words Stephen, and we wish you huge continued success with the website. While Stephen’s specific focus is small, there are so many other location to location type sites where there’s a lot of money to be made. For instance, Moving2Canada.com documents career options and visa advice for those looking to make the move to North America. The site is averaging 130,000 visitors every single month and is just one of dozens of sites helping people with advice on their possible move. The team behind M2C have built an impressive number of social media followers, with over 20,000 fans on Facebook. Similar to Irish Around Oz, they monetise their website with affiliate links and advertisements. It’s clearly successful, as even their Facebook cover photo has an advertisement on it. New to gaps? We take each case study to the next level. For every success story we feature, we highlight gaps in the market which reveal additional opportunities to be successful. Many are possible by simply changing the industry (or location) to focus on while others look at how to profit from other traffic sources or monetisation options. If, like us, you see massive potential to do this for other nationalities looking to move to other locations, you’ll love our strategy guide on how to take this idea to the next level. If you’re passionate about your home town, the current city you live in or if you’ve ever lived in another country then you will have experiences that will set you off from a fantastic foundation to build something like this for yourself. Want a detailed action plan on how we would personally target this industry? We’ve got you covered with a guide to exactly that. Click here to get the bonus. P.S. Clicking the heart button below to lets us know what types of success stories and opportunities you would like to see more of. Thank you for reading!